Flight-crew issues were the primary cause of two-thirds of fatal commercial and business plane crashes worldwide from 1997 through 2006, the United Kingdom's Civil Aviation Authority reported in 2009, according to the denverpost.com. A 2006 Federal Aviation Administration study found that from 1990 to 2002, 45 percent of major airline crashes in the United States and 75 percent of commuter-carrier accidents were due to mistakes made by pilots, co-pilots, and airline personnel. These statistics are disturbing and some type of investigation is needed to figure out what the root problem is leading to these human errors. 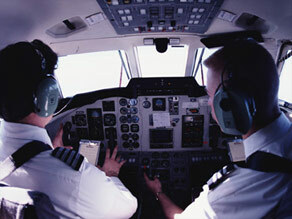 Some pilots believe cockpit automation has reduced basic flying skills that may be required in an emergency landing or problematic situation that arises during a flight. In fact, "loss of control" accidents were the most common form of airplane accidents accounting for 42 percent of commercial airplane deaths between 1999 and 2008, according to the Boeing Co. and the Commercial Aviation Safety Team . A "loss of control" accident is where the flight crew failed to recover from an unexpected event, like an engine failure or a stall. As a licensed pilot , I fully appreciate the challenges associated with operating an airplane. Being prepared for the unexpected is a prerequisite to flying properly, and safely. I think one of the key reasons we're seeing a high percentage of mistakes made by pilots and co-pilots is because of pilot fatigue. FAA regulations for regional and major airlines state that pilots can only fly airplanes for eight hours during a 24-hour period. When a pilot finishes the shift, they should have had at least nine hours of consecutive rest during the 24-hour period. However, these guidelines fail to factor in flight delays, jetlag, and untraditional work hours, according to CNN.com. When you couple pilot fatigue with the increased automation mentioned earlier, it creates a potentially volatile situation where a pilot is both physically and mentally unable to handle a sudden problem in the air. Will improving pilot work hours solve the problem? No one knows for sure, but it would be a good first step. The FAA needs to tackle this problem immediately. Too many people's lives are put at risk when they get on a plane with a pilot and co-pilot who are not fully energized and able to adequately handle the unexpected challenges a flight can present.